MONTEBELLO, Puerto Rico (AP) — Relatives helped Maribel Valentin Espino find shelter when Hurricane Maria roared through her community in northern Puerto Rico. Neighbors formed volunteer brigades to cut fallen trees and clear twisty mountain roads after the storm had passed. Now, friends and a local cattle ranch provide the water they need to survive in the tropical heat. Valentin and her husband say they have not seen anyone from the Puerto Rican government, much less the Federal Emergency Management Agency, since the storm tore up the island Sept. 20, killing at least 16 people and leaving nearly all 3.4 million people in Puerto Rico without power and most without water. Many others are also waiting for help from anyone from the federal or Puerto Rican government. But the scope of the devastation is so broad, and the relief effort so concentrated in San Juan, that many people from outside the capital say they have received little to no help. Valentin, her husband and teenage son live in one such area, Montebello, a 20-minute drive into what used to be lushly forested mountains near the northern coastal municipality of Manati. Hurricane Maria’s Category 4 winds stripped the trees bare and scattered them like matchsticks. “It seemed like a monster,” she recalled. The roads are passable now but the community is still isolated. “Nobody has visited, not from the government, not from the city, no one,” said Antonio Velez, a 64-year-old who has lived there his entire life. The same complaint echoed throughout the southeast coastal town of Yabucoa, the first town Maria hit as it barreled across the island with 155 mph winds. At a nearby river, dozens of people gathered to bathe and wash clothes as they grumbled about the lack of aid. Nearby, one girl engaged in a thumb war with a friend as she filled an empty water bottle with her other hand. Downstream, a woman sat cross-legged in the water behind a friend and helped wash her hair. The recovery in the first week since the storm has largely been a do-it-yourself affair. People collect water from wells and streams, clear roads and repair their own homes when they are not waiting in day-long lines for gasoline and diesel. For most, the only visible sign of authority are police officers directing traffic, a critical service because traffic lights are out across the island. There are several thousand U.S. federal employees in Puerto Rico helping with the recovery effort. They are most visible in San Juan, where officials with FEMA, Homeland Security, Customs and Border Protection have a presence at hotels that before the storm served tourists in the Condado neighborhood or at the convention center that has become a staging ground for relief efforts. Federal workers supplied diesel to generators at hospitals and delivered desperately needed food and water to hard-hit communities across the island. They have repaired the air traffic control systems and power at the airport, which is receiving about 100 flights a day but is still far from normal operations. U.S. agents have also provided security across the island and the Coast Guard has worked with local authorities to restore the sea ports, a vital link because Puerto Rico is almost completely dependent on imports. In addition, teams from the Army Corps of Engineers are helping to repair the electricity grid and to inspect and look for ways to avert the collapse of a dam near the western town of Quebradillas that has developed a crack and that officials have said could potentially fail. And personnel from Health and Human Services, the Department of Defense and Veterans Affairs have provided care and helped evacuate people from Puerto Rico with chronic medical conditions. Teams also were scheduled to visit the central mountain town of Aibonito, which was cut off from the rest of the island for five days. Many people began rationing their food and water supplies as they dwindled, unclear of when they would have contact with the outside world. Gov. Ricardo Rossello and Resident Commissioner Jennifer Gonzalez, the island’s representative in Congress, have said they intend to seek more than a billion dollars in federal assistance and they have praised the response to the disaster by President Donald Trump, who plans to visit Puerto Rico next week, as well as FEMA Administrator Brock Long. “I am confident that they understand the seriousness of the situation,” the governor said Tuesday. Still, it is hard to avoid the fact that the response looks different than previous ones. After hurricanes in Louisiana, Texas and Florida, waves of power company trucks from other states descended in long convoys, something that is obviously not possible on an island 1,000 miles to the southeast of the mainland. After the devastating earthquake in Haiti in January 2010, the U.S. military sent ships and the skies seemed to be filled with heavy-lift helicopters and planes carrying emergency relief, though the scale of that disaster was far worse. 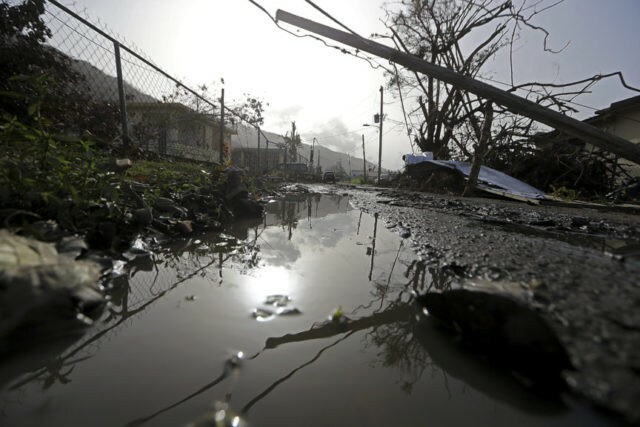 Hurricane Maria was the strongest hurricane to hit Puerto Rico in nearly 100 years and officials say the cost of recovery will dwarf that of the punishing Hurricane Georges in 1998. Whatever the final bill, Valentin just hopes it will factor in people like her. “If FEMA helps us, we are going to build again,” she said.